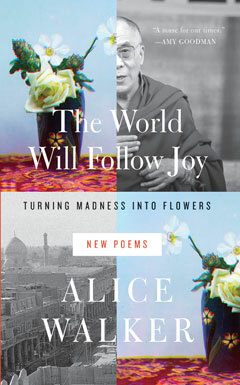 “Poetry is leading us,” writes Alice Walker in The World Will Follow Joy. In this luminous collection—a bestseller in hardcover—the beloved writer offers sixty poems to inspire and incite. Penetrating and sensitive, playful and wise, these intensely intimate poems establish a personal connection of rare immediacy between poet and reader, illustrating the very qualities that have won her a devoted following and continue to draw new readers to her writing. Attentively chronicling the conditions of human life today, Walker shows in her poetry her necessary political commitments, her compassion, and her spirituality. Casting her eye toward history, politics, and nature, as well as to world figures such as Jimmy Carter, Gloria Steinem, and the Dalai Lama, she is indeed a “muse for our times” (Amy Goodman). The World Will Follow Joy reminds us of our human capacity to come together and take action. Above all, the gems in this collection illuminate what it means to live in our world today. Maya Angelou was an indomitable spirit of great generosity, kindness, and love. Amy Goodman interviews Alice Walker on Democracy Now!